As communist governments began collapsing across Eastern Europe in 1989, President Bush responded with caution. He responded more forcefully to Panama’s declaration of war on the U.S. in 1989, and to Saddam Hussein’s invasion of Kuwait in 1990; American troops invaded Panama, removing dictator Manuel Noriega, and—as part of a 50-nation coalition—drove Iraqi troops out of Kuwait. Domestically, Bush oversaw a bailout of the savings and loan industry and, as part of a compromise with Congress, raised taxes in violation of his campaign promise. With the sudden apparent lack of international threats, the 1992 election focused on the economic issues, and Bush lost in a three-way election that saw only one state (Bill Clinton’s Arkansas) give any candidate a majority of its votes. Bush retired to Houston but continued to actively serve his country when called upon by subsequent presidents, regardless of party affiliation. 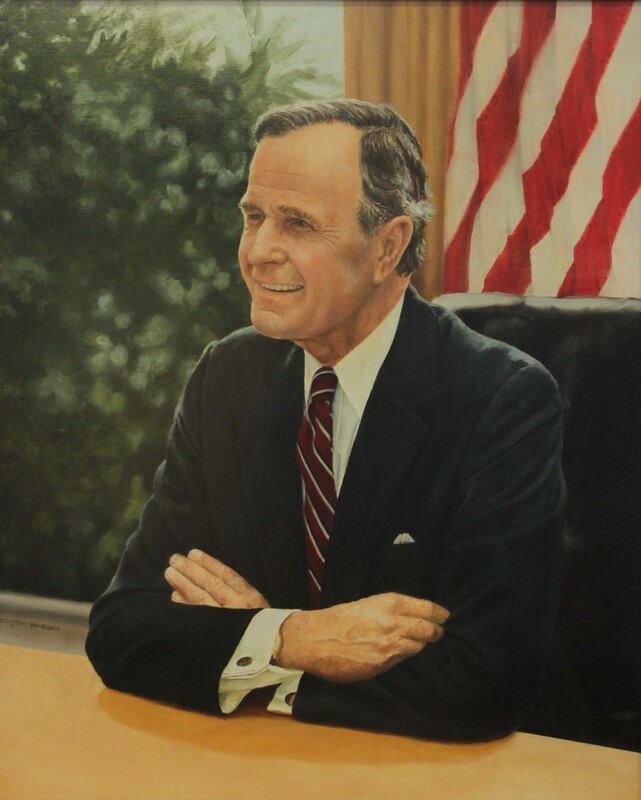 George Bush died on November 30, 2018. Funeral services will be held in Washington, D.C., on Wednesday, December 5, at 10:00 AM Central Time. Those wishing to watch the C-SPAN broadcast of the services are invited to gather in the library of the Presidential Archives at that time. As we remember George Bush, we are thankful for his example of what it means to be a Texan, to be an American, to be a son, a husband, and a father, to be a leader with honor, and to live a life of faithful service to others. Note: The Bush family’s home in Odessa is now owned by U.T. Permian Basin and located at the Presidential Archives, 4919 E. University, Odessa. The home is open 8:00-5:00, Monday through Friday.